More than 6,000 families across Northern Ireland are being paid more than £26,000 in benefits — the equivalent of a £34,000 gross salary for individuals who are paying tax, it has been revealed. TUV leader Jim Allister, who uncovered the information through an Assembly question to Social Development Minister Mervyn Storey, said that schools, hospitals and other areas of Stormont spending would increasingly be hit as Stormont looks set to agree that those high benefit payouts will be maintained. Mr Allister’s question also established that by far the highest number of families claiming more than £26,000 a year in benefits live in the Sinn Fein stronghold of West Belfast, where 850 people earn above that figure. There are 570 such families in North Belfast, 550 in Foyle, 510 in West Tyrone and just 150 in North Down. 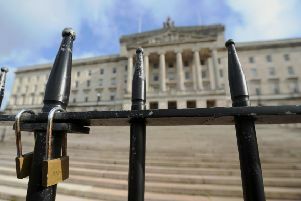 Mr Allister said that the Welfare Reform Bill “is of immense significance not least because it breaks the principle of parity. No longer will all claimants throughout the UK be paid the same benefits”. And the TUV leader added: “While the relevant regulations have yet to be published, it seems Northern Ireland, because of Sinn Fein pressure in the lead-up to Christmas, will continue to pay 6,600 families in Northern Ireland benefits in excess of the cap of £26,000, several hundred of whom would be capped if they lived in GB. “We, at the expense of schools and hospitals, will continue to keep them at the standard to which they have become accustomed on public handouts.